Oil cleansing isn’t a new thing to most of you, but there’s been an abundance of luxury oil cleansers launching that offer a little more than what pure plant oils do for you during your cleansing experience. A new one on the market is from one of my favorite chic brands, African Botanics. 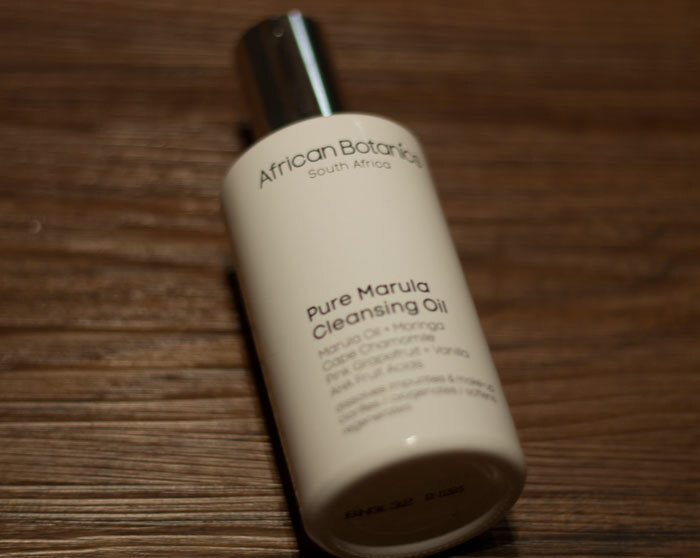 Its new Pure Marula Cleansing Oil gives you the feel of a slippery oil, emulsion of a gentle cleanser and the smell of a pink grapefruit Creamsicle. When I oil cleanse, I apply oil with dry hands onto my dry face and typically work in circular motions starting on my cheeks, working into my nose, chin and neck and then coming back up to my forehead. I reserve my eye area for last because that’s where I wear the most makeup; it gets ugly really quick if I start there! 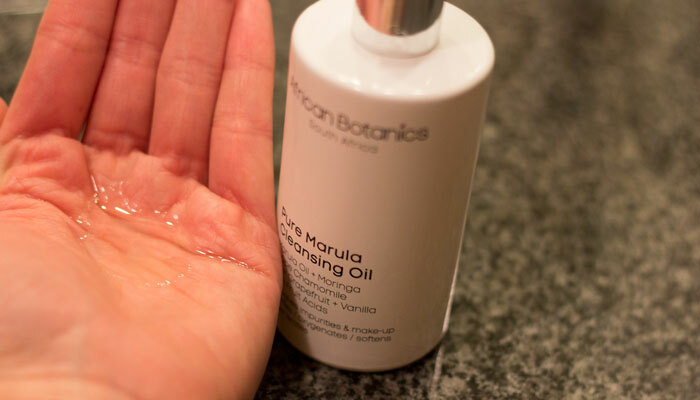 While African Botanics Pure Marula Cleansing Oil does a great job of breaking down foundation, blush and other makeup I wear on my skin, I found irritating to use on my eyes; it stung with or without wearing my contacts! I checked the back of the bottle to make sure I didn’t mess up some step with cleansing around my eye area. I followed the instructions to a T and still experienced discomfort. No bueno! I’m wondering if it has something to do with the pink grapefruit oil and lemon extract? During other testing times, I avoided my eye area and just enjoyed inhaling the comforting, summertime scent of citrus and cream. I like the slip that the combination of marula oil, mooring oil, baobab oil and cape camomile oil lend to this oil cleanser. It’s not thick and heavy like my usual pure jojoba oil, but so light and delicate that it could almost pass for a facial oil (if not for that whole gentle-emulsion-when-it-meets-water thing). With that said, I do find the naming of this product confusing; I was assuming I’d be getting a straight marula cleansing oil, but it’s much more. Cold-pressed marula oil sourced from South Africa offers a powerful cocktail of skin-protecting antioxidants such as vitamins C and E as well as omegas 9 and 6, essential fatty acids that deeply hydrate and reduce redness. Moringa oil is a somewhat new oil to me. It’s responsible for the detoxifying, toning and tightening factor of this particular cleansing oil. Could the astringent-like properties of this oil be the source of my eye irritation? Omega-rich super fruit baobab contains a beautiful oil that’s high in antioxidants, vitamins A, B, D & E and essential fatty acids. It’s also said to increase firmness and elasticity. For effects like this, you probably want to give your face a nice, long cleansing massage so your skin can soak up the goodness. Another new-to-me oil is Cape Camomile. This South African wild-harvested relative of chamomile helps reduces inflammation and soothe irritation. I’d love to see this in a facial oil! All in all, I really loved my experience with this oil cleanser; the smell is delightful and the packaging looks sophisticated (love that opaque white glass bottle!). But, I’ve got to hold out for a “sensitive eyes” version or reformulation before adding it to my repurchase list. Have you tried anything from African Botanics? Do you use any luxury oil cleansers? Tell me in the comments section!